I love romantic movies just as much as the next person. The Notebook? One of my favorites (it’s on my DVR right now, actually.) I saw Titanic in the movie theater three times. So, I want to preempt this post by saying I am, admittedly, a bit of a romantic. That being said, I am also well aware that these version of love are watered down, beefed up, oversimplified, or just plain unrealistic. In other words: they aren’t real. It may seem a little bit obvious, but I swear to you I hear people tell me all the time that they are waiting for their movie moment. Some people may be waiting for their movie moments without even knowing it because movies do a good job of making us swoon. Of course we want those big love stories that are epic. We hold these visions in our hearts and minds and you know what they do? They mess the very real, good love stories that come our way. Whether you are looking for love, have found love, or are anywhere in between those two, I want to help you let yourself off the hook. Real life love will never be like the movies, no matter how hard you try to convince yourself otherwise. It is useless to compare your relationship to any movie relationship...in fact, I believe doing so can result in a huge amount of personal frustration. I’ve heard people say that they are waiting for their “fairytale endings” or that they want it to be “like in the movies.” Whenever I hear this, it’s a signal that people have this unattainable vision in their minds that can never be achieved. I start to wonder if what these people want is love at all...or is it a thinly veiled attempt to insulate themselves from finding love so that they never have to be vulnerable and risk getting hurt at all. 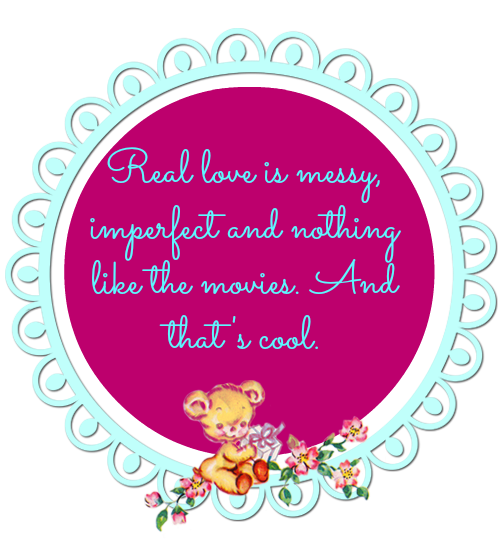 Love--real love--it’s messy. It can be difficult, it takes work, and at times it more closely resembles a scary movie, not a romantic one. Sure, you get your moments that feel like being swept off your feet. I would consider my engagement one of those times. Those moments are once-in-a-lifetime, take your breath away moments--they aren’t a lifetime. To experience true, deep love you’ve got to take the good with the bad and the love you share is the power behind it all. So if you’ve been wittingly or unwittingly pinning your hopes on fireworks, big gestures, and/or Mr. Perfect (who by the way, doesn’t exist), you’ve got to get a new vision in your head! The man of your dreams may be nothing like the movies....he might actually be, well, REAL! Love everything about this post. So, so true!